Nuna Pipa is an amazing car seat. I loved it at first glance, but Lucas and I stopped at Nordstrom in Nashville last November to test it out in person. I chose it for a couple of reasons. First, it is light. Second, it is a cool design. Third, it has great safety features. Fourth, it is easy to pop in and out. Finally, it has several options to cover your baby. We chose black because it is gender neutral should our next little one be a boy. This octopus makes creepy noises and glows. My mom bought it for Eila and guess what? It is the most effective noisemaker we have (and we have a good bit!) Also effective is "Love Yourself" by Justin Bieber. She digs it. 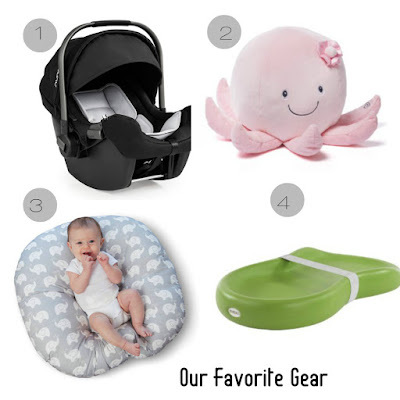 The Boppy Newborn Lounger is a great way to allow your arms some relief in any room! Especially since Eila has put on a few pounds she doesn't sink into the middle quite as much. We travel with it. It is my lifesaver, and she loves it. I had mom buy one of her own since she will be keeping Eila starting in May. You can find it at Target at the excellent price point of $29.99. The Keekaroo Peanut Changer is also a genius product but it is a bit more expensive. But hear me out - in the middle of the night, you are not going to want to walk all the way to the nursery to change the baby. We take this bad boy from room to room during the day. More than that, its surface is very easy to clean. Eila has pooped and peed mid-diaper change, and we are SO glad that we could just Clorox wipe the surface afterward. The money was well spent for sure!